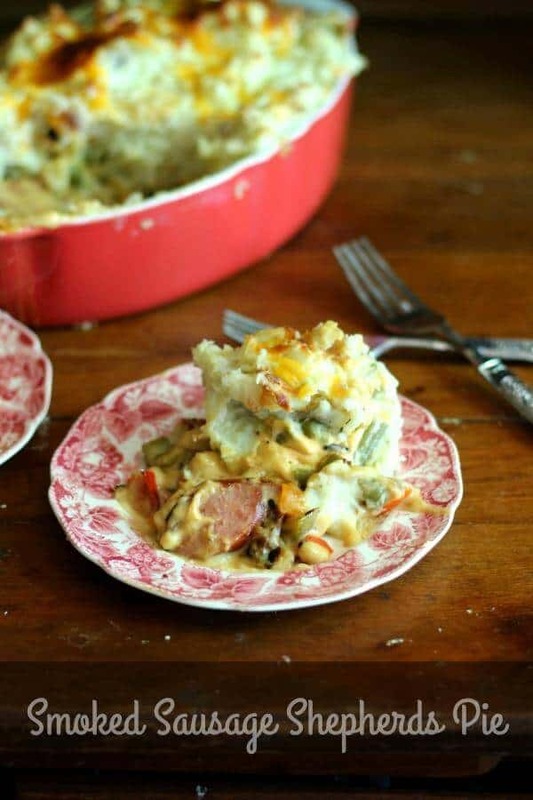 Cheesy twist on the classic, this smoked sausage shepherds pie is quick and easy. Sausage, peppers, onions, and green beans are smothered in a cheese sauce and topped with a thick crust of mashed potatoes. This is sure to be a family favorite! “This post is part of a social shopper marketing insight campaign with Pollinate Media Group® and Hillshire Farm, but all my opinions are my own. When I think of comfort food shepherds pie is always one of the first dishes that comes to mind. Creamy gravy, seasoned meat, mounds of fluffy mashed potatoes? Yes please! Who could possibly resist all of that? When I was asked to create a quick, family recipe that included Hillshire Farm Smoked Sausage I knew it was going to be a smoked sausage shepherds pie for sure. It’s been a recipe I’ve been playing with for a while and I was glad to have the impetus to really work at it. I made a few notes and headed to the meat department at Kroger to pick up the smoked sausage and other things I needed. There are times when I take a lot of time to make dinner but there are other times when … you know… life happens. The beauty of this recipe is you can cut some corners when you are in a hurry. Kroger has some chopped onions and peppers in the freezer section, for example, that will cut the prep time down a lot. Homemade cheese sauce is the best as far as I’m concerned but in a pinch you can use condensed cream of celery soup and mix the shredded cheese into it. You can also pick up mashed potatoes in the deli section and cut time that way. Even if you don’t cut any corners this simple Hillshire Farm smoke sausage recipe is only going to take about a half hour. I love recipes like this — the ones that taste like you worked on them for hours but in reality you threw it together in minutes. You can assemble it ahead of time and keep it tightly covered in the fridge for a day or two before baking and serving. I’m telling ya’ this is one of those recipes that you’ll go back to again and again. You’ll find more Hillshire Farm smoked sausage recipes on the Hillshire Farm website. If you’re anything like me you’re always looking for more easy recipes to add to the recipe box! Here are some of my favorites! Smoked sausage, peppers, onions, and green peppers are covered with a creamy, cheesy sauce, and topped with mashed potatoes. An easy, comforting weeknight meal that you can have on the table in 30 minutes or less. Grease a casserole dish, add the sliced sausage, and set it aside. Mash with the 1 cup hot milk and 2 tablespoons butter. Melt 2 tablespoons of butter in a heavy sauce pan. 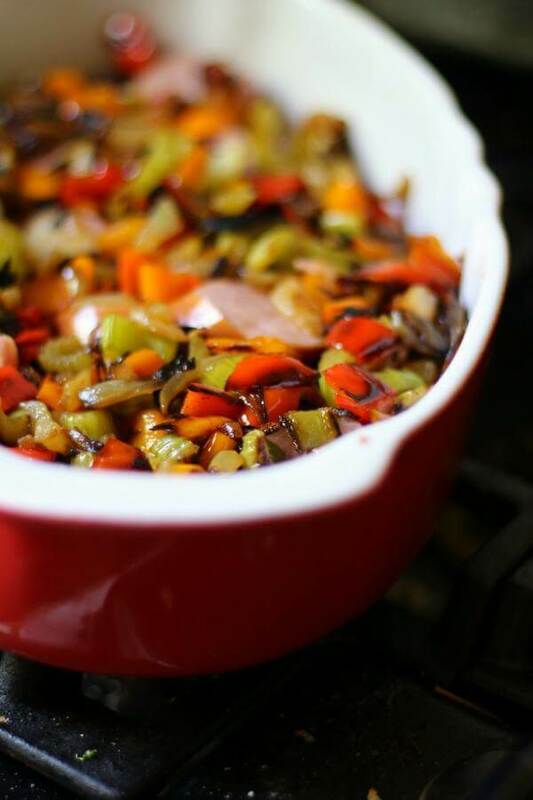 Add the onion, peppers, and celery and saute until soft and caramelized on the edges. Remove the vegetables from the pan and spoon over the sausage. Cover with the green beans. Add the remaining butter to the pan and melt it over medium heat. Whisk in the flour, garlic, paprika, and mustard -- stirring for 2 minutes. Pour in the milk, whisking constantly until smooth. Simmer for 2 minutes or until the sauce thickens. Add the cream cheese and cheddar and whisk until smooth. Mix the soup and cheese. Heat until smooth in the microwave. Pour the cheese sauce over the vegetables and sausage. Sprinkle with a little more grated cheese. Bake for 15 minutes, or until piping hot and lightly browned on the top. Normally I am not a shepherd’s pie fan – but the sausage had me curious so I made this recipe of yours on the 7th – maybe – it was a Thursday – anyway – I used ALL the shortcuts. I admit it!! This was super yummy! My husband said that I needed to add it to the recipe rotation. I also made it for a family with a sick Dad. They raved over it too! Thank you for sharing your recipes! MY husband loves shepherd’s pie! This sounds like a delicious one to make for him! 🙂 I hope he likes it as much as we do. What a great weeknight meal! Love that you used smoked sausage….yum! Thanks! It really is a nice change. Love Shepherd’s Pie! It is so comforting, like a big bowl of stew on a cold night. Smoked sausage is a great twist to the traditional ground beef! 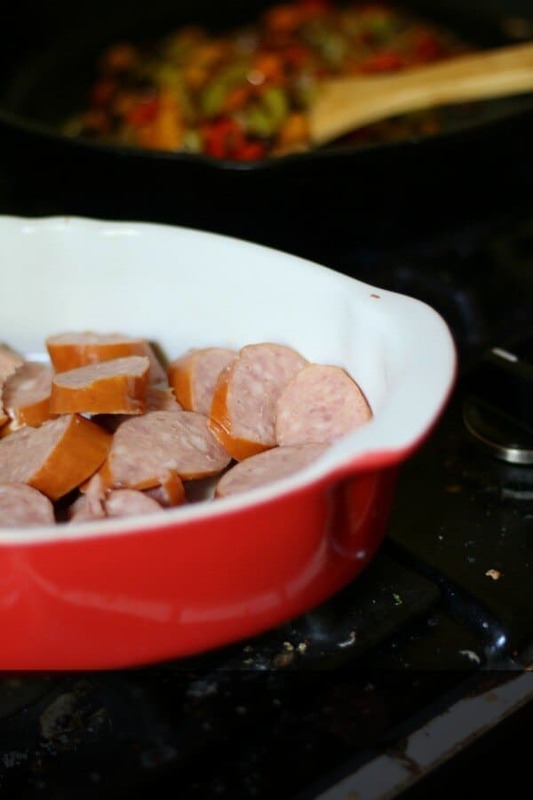 This sounds so good – I’m always looking for different ways to use kielbasa! This looks so amazing and the perfect comfort food! What a great twist on shepherds pie! I find it so hard to make recipes with smoked sausage because I can’t help but to snack on it while preparing everything else for the recipe. I can’t be the only one! 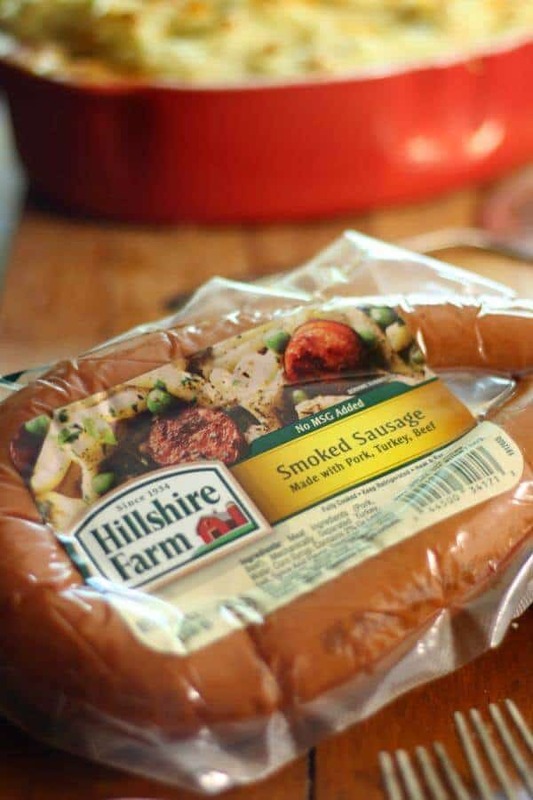 Hillshire Farm Smoked Sausage is the bomb and totally irresistible as soon as you open the package. Your shepherds pie looks amazing and I bet it tastes delicious! I love that you made shepherd’s pie with sausage. I think sausage is probably my favorite meat. This is going to be so tasty. Yum! This looks so much better than boring ol’ shepherds pie! The combination of sausage and cheese sauce with the sweet peppers is so good!